Experiment with a variety of template layouts and sizes, and see changes displayed instantly in your browser. 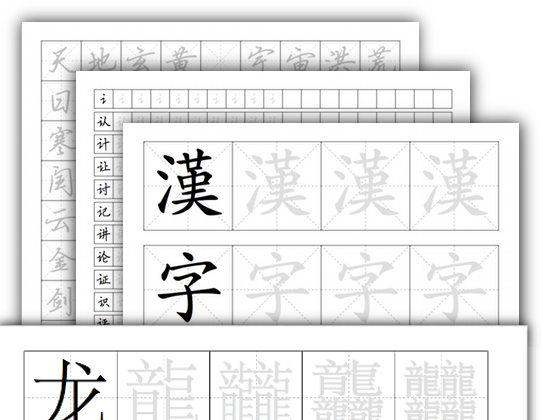 Generated templates can be empty or contain Traditional/Simplified characters of your choosing. Click the button below to register and get started making your own practice grids today. Simply type some Chinese text and have it appear in the grid. Both Simplified and Traditional characters are supported, as are rare and uncommon characters. A wide range of options allows you to set grid size, spacing, guide lines and more, all of which can be previewed in your browser in real-time. Download and save grids as PDF files which can be printed out whenever you need, or print directly from the browser.